If something untoward should happen to your computer then a good backup is all that stands between you and complete disaster - it may seem like a chore to duplicate all your files but you're going to be glad you did if your machine gets beyond repair. Fortunately, backing up is now easier than ever: the new wave of cloud storage services can do the job for you in the background while you work. In fact, you can use one of these tools in place of an external hard drive in many cases, as we'll demonstrate here. Services such as OneDrive, Dropbox, Google Drive, Box and iCloud automatically transfer your files to the web as you create and edit them. There are no schedules to think about, no manual transfers to plan and no waiting for files to copy over to an external disk. All of your data is available instantly online and is always up to date (or close to it). That also means you can get at your files via a web browser on any computer - home, office, the library, your friend's house. All of these services have mobile apps too if you need to browse through your files on a phone or tablet, and the majority do a good job of backing up your mobile photos as well as important files from your laptops and desktops. 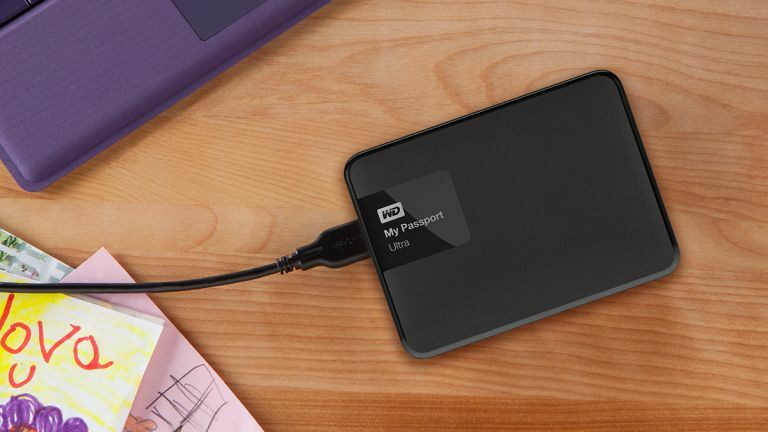 Not only are you saved the effort of lugging around an external hard drive with you wherever you take your laptop, your files are safe even if your house burns to the ground or gets flooded. No matter what happens to your computer and any drives you have with it, you'll know that your backups are safe and sound online ready to download again. Keeping files online is a much more viable option than it used to be thanks to increasing internet speeds and falling storage costs, but there are some disadvantages compared with having an external hard drive to hand. One is transfer speed: it's still usually quicker to copy a file to a local disk connected via USB than it is to wait for it to upload or download. There's also cost to consider. Most cloud storage services give you a few gigabytes of space to play around with (usually 5-15GB) and if you need more than that you're going to have to fork out for a monthly subscription: the going rate is typically £10 (or $10) a month for 1TB of space. You're paying more in the long term than you would be for a 1TB external drive. And then you're relying on Google, Dropbox or whoever to keep your files available and safe from prying eyes. These services don't get hit with downtime or security alerts very often, but it's always a possibility - while we've suggested ditching your external hard drive in the title of this feature it's actually a good idea to combine both options together. We've previously done an extensive round-up of the cloud storage options available to you, and all the big names have a service you can use: Microsoft, Apple, Google and Amazon. Add to that independent operations such as Dropbox and Box and there's no shortage of apps to pick from, all offering more or less the same back up and syncing capabilities. The one that's best for you will depend on the systems and platforms you're already using: OneDrive is tightly integrated into Windows 10, for example, while iCloud makes a lot of sense for people with Apple kit. OneDrive, Google Drive and iCloud all offer lightweight online office apps you can take advantage of too, which is worth considering. You can try out all of these tools for free to see which you like best, and then subscribe to your favourite one - as we've mentioned, around £10 for 1TB is common, though you get that amount free on OneDrive if you're an Office 365 subscriber, while Apple's UK pricing for 1TB is currently at £6.99/month. Check online for the latest offers and pricing plans. All of these storage services come with a desktop client: simply get it up and running them move all of your important files into the designated folder to begin the syncing process. The initial upload may take a while but after that files will be sent to the cloud automatically as and when you create or edit them. You can also upload files through your web browser. Most services let you sync files across multiple computers and even sync different folders to each (while everything is safely stored online too). You can in theory upload files to the web and delete the local versions, though we've already mentioned the importance of having multiple copies of your files to fall back on should something happen to the originals. The platforms you use will play a part in your choice of service as well: iCloud support is non-existent for Android and patchy for Windows, for example, so bear that in mind when picking a cloud storage provider from the pile. Once you've chosen one, you can be up and running and syncing your files to the web from anywhere in a matter of minutes. If you'd rather use a dedicated backup tool, find out which ones we like best.